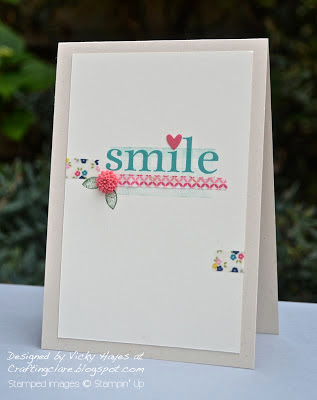 Stampin' Up ideas and supplies from Vicky at Crafting Clare's Paper Moments: Happy Day in three minutes! Happy Day in three minutes! It was time to embellish! 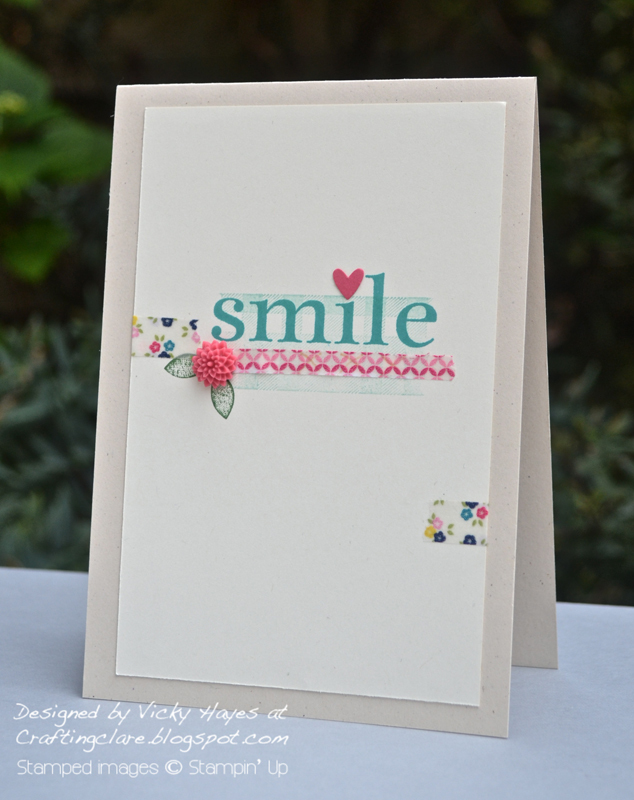 I added stamped leaves from Bright Blossoms, one of the gorgeous little dahlia embellishments, a punched heart to dot the 'i' and some extra floral washi accents - all designed to put the focus on that show-stopper of a sentiment! And why not order some gorgeous new stash from the new catalogue at the same time?! Have you been watching the tennis at Wimbledon? I haven't had time to see much at all over the last week but I did manage to catch a bit of the drama yesterday when Andy Murray had a bit of a tough match against Fernando Verdasco. Who needs to run around a tennis court when you can get an excellent cardio workout on your own sofa?! I really like the splashes of colour on the white-on-white card! This is gorgeous, Vicky. Bermuda Bay looks a fabulous colour. Lovely card. And I like your tip on cutting washi tape. You're rocking the washi this week, Vicky! 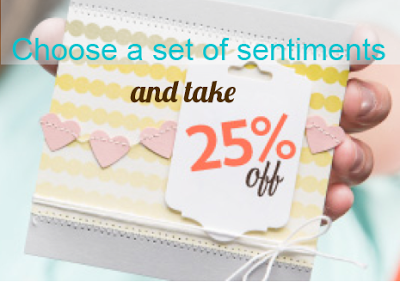 Loving that big, bold sentiment and the subtle gingham. Vicky, your card made me smile, it's so pretty. I've been glued to the tennis, and I'm typing this waiting for Andy to come out for the semi final!